Although we certainly are carnivores in my family, I love to eat meatless meals and try to eat about three dinners a week without any meat. For those interested in the health and environmental benefits of eating less meat, you can read books by Mark Bittman and Michael Pollan, who both still enjoy an occasional steak. On our weekly pizza night, I always fix a vegetarian pizza for myself (with maybe some good anchovies). I try to fix at least one or two seafood/fish dinners a week and I love to make meatless pasta dishes. But one of the best meals you can fix for dinner involves that super food: beans. It's a high quality protein that is very cheap with no animal fat and lots of fiber. I get my beans these days mostly from Rancho Gordo, that wonderful farm out in Napa Valley run by Steve Sando. He grows the most high quality, fresh beans you will ever taste. You certainly can used canned beans and they are fine, but try buying some great quality dried beans sometime. They are still so much cheaper than buying meat. He has some wonderful varieties that you will never find in the grocery store. For this recipe, I used cellini. You really can use any bean you like. A lot of people are confused about how to cook dried beans and are scared to try. It's so easy. You just soak and simmer. Sometimes I just throw the beans in a pot and cover with cold water to soak before I go to bed. If I don't do that, I just go ahead and throw them in some water in the morning and let them soak all day. There is no exact science to it. After they soak you just need to give yourself a couple of hours to cook them, depending on what kind of bean you have and how long they have soaked. I just put mine on to simmer with some aromatics and start tasting them after an hour and keep tasting them until they are the texture I like. That's it. The rule of thumb in cooking beans is to not add salt until the last 15 or 20 minutes of cooking because it is believed that the salt makes them tougher. I always did this until earlier this year, when I read an article in Gourmet magazine's April issue about cooking beans. They tested this myth and cooked several batches of beans. They found out that the beans which they salted before cooking ended up slightly more tender than those cooked with no salt, or had the salt added at the end of cooking. Also, the beans cooked slightly faster and the tasters felt the salted beans had more flavor. Myth buster! So now I'm putting the salt right in the pot to cook along with the beans. These tomatoes, served with some whole wheat pita bread and a green salad, are a perfect meal (along with a nice crisp bottle of white wine, of course). Drain the beans and place in a saucepan with 1 bay leave, several peppercorns, a clove of garlic and 1 tablespoon of salt. Add water to cover by a at least an inch and simmer over low heat, covered, until tender about 1-1/2 to 2 hours. Drain and remove bay leaf, garlic and peppercorns. Drizzle with 1/4 cup of the olive oil. Slice tops off of the tomatoes and scoop out seeds and most of the flesh with a spoon. Lightly salt the inside of each tomato and place upside down on paper towels to drain for about 3o minutes. In a bowl, stir together the beans, tuna fish, onion, parsley and the remainder of the olive oil. Generously season with salt to taste and add pepper to taste. Spoon the mixture into the tomatoes and serve. Oooh, yum! That looks so tasty, not to mention healthy. I'm going adding this to my menu for this week. Um, fish is still meat. It may not be red, and it may not be from something on four legs, but it is still the muscle from a living thing, and therefore meat. sorry to be picky, but vegetarian means eating only vegetable products. If you eat only fish you are a pescatarian, but you are NOT a vegetarian. Okay, I knew I would get this right away from someone - that fish is still a meat. Well, for me, being Catholic, we have meatless meals during Lent and fish is allowed. It's always been this way for me. I didn't tag this recipe anyway as a vegetarian recipe - but for me, it is a meatless meal - no beef, pork or poultry. You can certainly leave the tuna out. I think I call myself a flexitarian, very veggie friendly. I have a love affair with tomatoes also. We eat meat about twice a week, just because we love meatless dishes. It's a benefit that it's a benefit. This looks very spinach tiger friendly...so hearty and I love white beans. Also such a nice idea for the warmer weather. The tuscan bean soup looks DElicious. Hi! This looks so yummy! Do you think it can be made ahead? 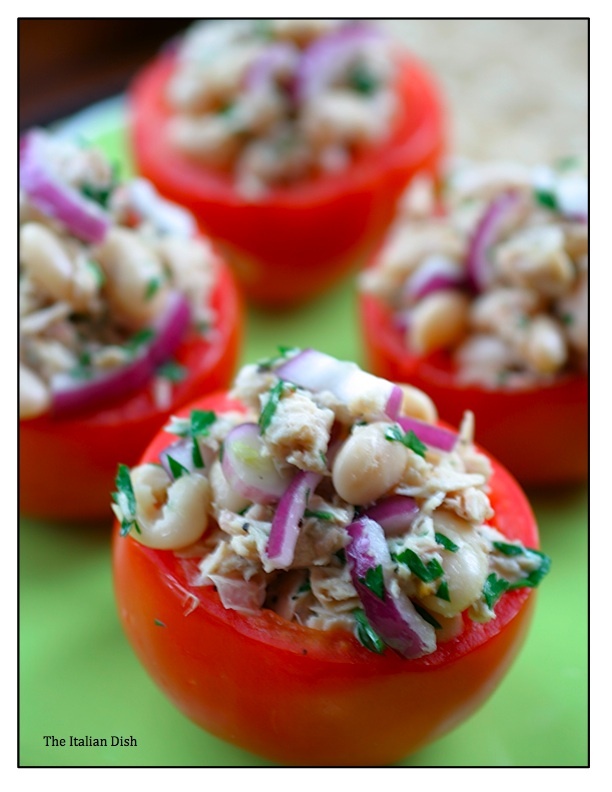 The tuna/bean part certainly can, but what about the tomatoes and then stuffing them? Thanks! Sara: The stuffing can be made ahead and then be brought back to room temperature before serving. I would not recommend stuffing the tomatoes and refrigerating them, because placing tomatoes in the refrigerator ruins their taste and tends to make them mealy. You can just place the tomatoes upside down to drain and then leave them out at room temp until ready to stuff. That stuffed tomato looks like the perfect meal. I eat meat too but I do enjoy a meatless meal now and again. I have to admit, I'm one of those people who prefers canned beans to soaking. I have tried the soaking method a couple of times, and I always prefer the canned. Maybe I just don't have the touch. And may I say that is one lovely looking tomato. I don't know what I'd do without veggies, I always make a couple veggie meals a week, I just made spinach stuffed portabella's tonight for dinner along with a salad and some good crusty bread! Thanks for the bean tutorial, I think sometimes I try to rush them and their not cooked through enough. 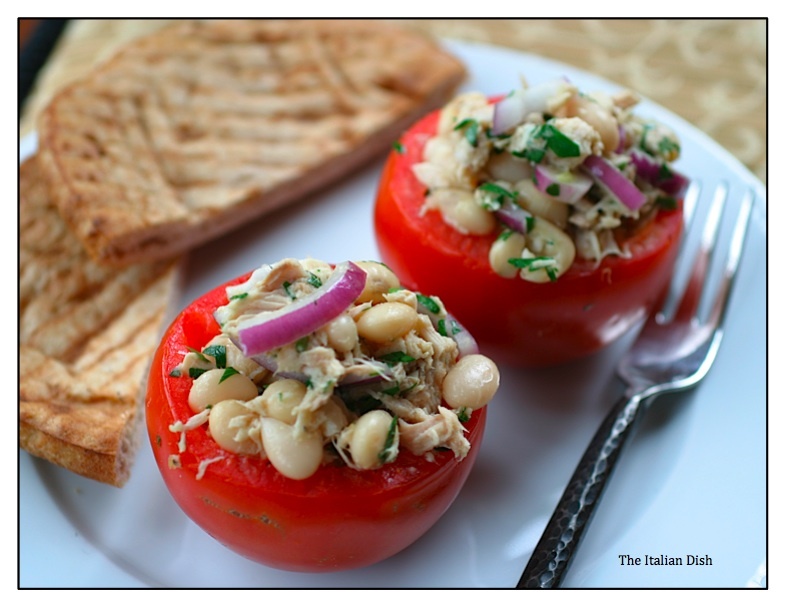 Your stuffed tomatoes look awesome and so do your photo's! The beans and grain make a complete protein too! I'll never forget my first Tuscan bean soup in Italy served by the owner of the small restaurant. It nourished my soul. I don't soak beans. I just start cooking them either in the pressure cooker or a slow cooker. I prefer the slow cooker -- and while the beans take longer to cook (3-4 hours), the soaking time is eliminated. Great results every time. Wow, the slow cooker is a great idea. I'll have to try that! Thanks! Beans r great specially in this hard economic times. Add some meat and its a filling nutritious and tasty meal. I didn't know fish could hold up to it- will try your recipe. A good way to cook beans is soak for few hrs, drain the water (gets rid of gases and makes it a bit more stomach friendly) and cook in a pressure cooker. It hardly takes 2 mins, yes for 1/2 cup dried beans! And believe me texture, taste, everything is the same- and saves cooking gas too! Last thing- I agree adding salt in the cooking pot is great because salt draws out the water and cooks it faster- agree with your myth buster. But I have especially hard time cooking black beans with salt (even with a pressure cooker for 20 -30 mins). So I always cooks black beans without salt and add salt later. It seems to be the rule here- but really not necessary for any other beans. 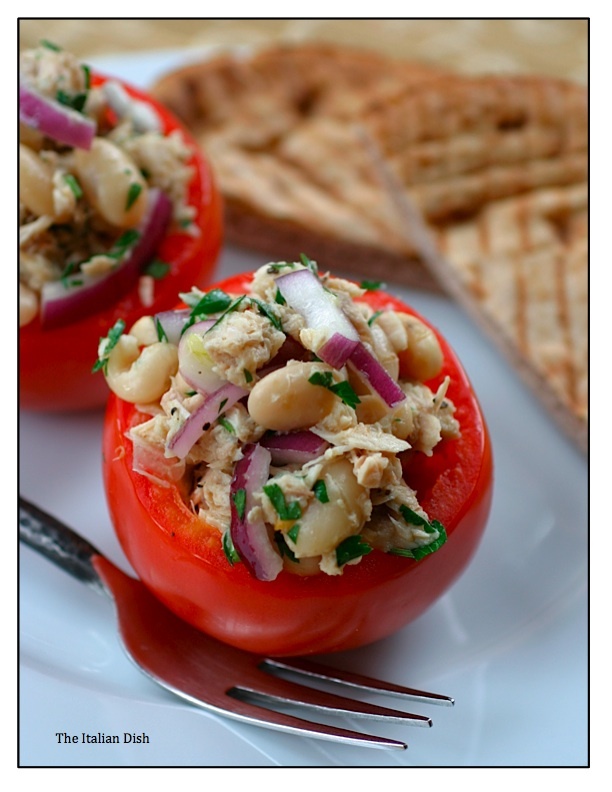 I was made this tomatoes stuffed with tuna and Cellini beans for dinner tonight, and it was delicious! I was a little nervous it wouldn't have enough depth of flavor, but it turned out scrumptious. even my hubby was loved eating this...as long as he can use his fingers. thank you for shearing your post. I am a vegetarian and I see no reason why we can't just enjoy a cool recipe post, appreciate people eating healthier, and refrain from nit-picking every little thing. Thank you for the post and the mythbuster on beans, it's a real help.